Apologies for my poor photography. The larger silver boxes are the tobacco tins presented by Lloyds to the Powerfuls at the dinner on May 7th. They were unnamed athough some were later engaved by the recipients. 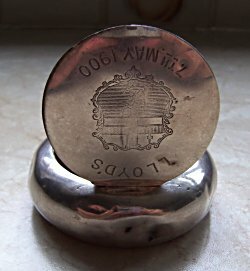 They were engraved with the Lloyds crest and the date. Frank Edgar Buxton was born in Paddington, London, on 4 July 1879, and joined the Royal Navy as a Boy 2nd Class on 3 January 1896, an ironmonger’s assistant by trade. He served aboard H.M.S. 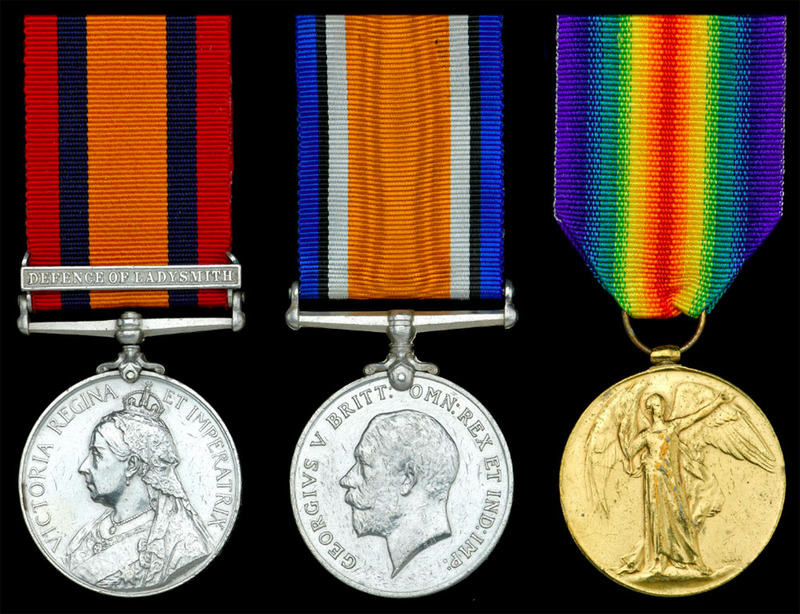 Powerful from 8 June 1897 to 8 June 1900, serving in South Africa at the defence of Ladysmith (Medal with clasp). Thereafter he appears to have had rather a chequered career in the Navy, having ‘Run’ from Pembroke I on 8 August 1900 and sentenced to 21 days imprisonment. He was confined to cells on four further occasions before being discharged on expiration of his Continuous Service Engagement on 9 July 1909. Having emigrated to Australia he enlisted into the A.I.F. at Melbourne on 22 November 1915, joining “C” Flight, No. 1 Squadron, Australian Flying Corps, and embarked for service abroad on 16 March 1916. Whilst in Cairo he was admitted to hospital where he underwent amputation of a finger of his right hand, after which he was transferred to England on 7 July 1916. In August 1916 he was taken on the strength of the A.I.F. War Chest Club and in April 1917 he transferred to the A.F.C. Depot at Perham Downs. In June 1917 he was attached to 30th Training Squadron, and in January 1918 to 1st Wing A.R.S. He embarked in March 1919 for return to Australia per Kildonian Castle, arriving at Melbourne on 7 May, where he was discharged ‘medically unfit’ on 21 June 1919.